As a second encore to the efforts of Roy Halladay and Roy Oswalt in Philadelphia, Cole Hamels will take the ball Tuesday in San Francisco to kick off a pivotal NLCS Game 3. Having salvaged a home split, The Phils will now try to take two of three – or better – in San Francisco to regain control of the Championship Series. Let’s take a closer look at some minutiae that could help the Phillies grab their first lead of the series. Pretty graphs! Cool analysis! Candy! I promise at least two of these things after the jump. The Giants lineup is primarily right-handed, and Cole will need to utilize his fastball and cutter inside on the righties to set up the low and outside change. Throughout the course of the 2010 season, Cole has frequented the outside corner with his change, and that location has proved to yield outs in abundance. 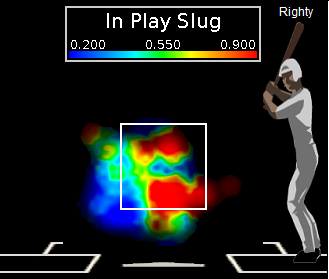 A look at some heat maps – provided by the wonderful people at Baseball Analytics – shows just how frequently Cole liked to hit the outside corner with his change against righties (top), and just how ineffective those hitters have been when Cole hits his spots (bottom). Compare that to the collective SLG that opposing hitters have against Cole’s change, and a similarity emerges: righties really aren’t doing any damage against Cole’s change-up down and away. Notice, also, that these pitches aren’t being burned. 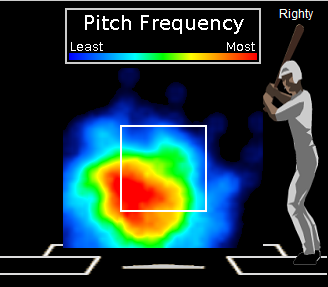 Cole is hitting the strike zone pretty consistently, and those change-ups that do cross in that area of the zone – including the area a couple inches outside – result in opponents hitting just .186 with a .209 SLG. On the other hand, if Cole misses over the middle or on the inner half, those numbers balloon to a .419 AVG and .806 SLG. The San Francisco lineup isn’t exactly one to fear (outside of Babe Cody Ross, obviously), but exploiting this strength could be an effective means of suppressing the Giants offense. After being shut down by Javier Lopez in Game 1, Charlie Manuel tweaked his lineup by shifting Chase Utley up to second in the batting order and Placido Polanco down to third. The concept of splitting the lefties is a fair one, but Jayson Werth should probably be the one to man the divide between Utley and Ryan Howard. Throwing out the idea of “protection,” Werth would be best served batting third, with any one of Polanco, Rollins or even Ruiz taking the fifth spot. Werth hit .300/.382/.556 in 453 PA against righties this year, and projected Giants starter Matt Cain happens to be a righty. Polanco, to his credit, hit .305/.346/.403 in 426 PA against righties in 2010, but that’s a .189 gap in OPS. Werth’s on-base skills and power should prove more beneficial batting third than Polanco’s. This one’s pretty simple: take the lead early in the game, and your odds of winning look better. When the Phillies had the lead after two innings during the regular season, they went 45-8. Conversely, when trailing after two, the Phillies only managed a 17-39 record. In a series where runs will likely remain available only at a premium, taking control early could hold some intangible worth; neutralizing a San Francisco crowd that is likely to be awfully noisy could go a long way (admittedly, of course, there’s no way to really measure that). Take an early lead and let the pitching take care of the rest. It’s worth another plug, so thanks again to the Baseball Analytics crew for use of their wonderful toys and the production of the heat maps used in this post.